Exploring the city by bicycle is a perfect way to explore Toronto’s many neighborhoods. Follow this itinerary for a budget-friendly ride through a few of my favorite areas. Local’s itinerary: Start your journey at the Coxwell Avenue Subway in Greektown. Here you can find a Toronto Bike-Share stand where you can rent a bicycle for the day. 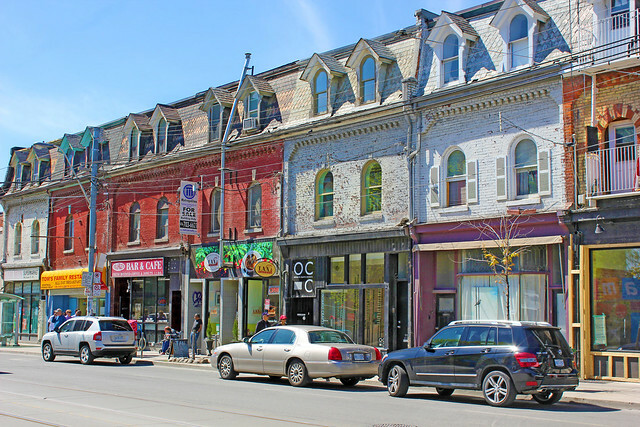 Head out along Danforth Avenue to appreciate the character of the neighbourhood. Turn south along Broadview Avenue and take your first stop at Riverdale East Park to get a caffeine hit at the local favourite – Rooster Coffee. Continue on to Queen Street where you will turn west and head to the Distillery District. Here you’ll find art studios that display beautiful works done by local artists. Grab a sandwich from Bricks Bakery for a budget-friendly lunch before heading back to Queen Street. Cycle across town and stop once you reach the Queen West area for some funky window shopping. Your last stop is Trinity Bellwoods Park. If you’re thirsty, grab a craft beer from Trinity Bellwoods Brewery ($4-8/bottle). While I can’t officially condone drinking them in the park, you’ll see many locals doing so. Insider’s advice: This route doesn’t follow streets with designated bike paths, however you can click to view the dozens of bike routes around Toronto. The Bike Share program does not provide helmets, so bring your own. This route stays mostly on bike lanes, however be careful on Queen Street due to the traffic. Biking is not the same as biking in certain European countries, however in general, cars respect bikes. Budget tips: To keep this bike rental on budget, you need to get a little bit creative. (More info about the bike share programme). The day pass includes unlimited 30 minutes rides, but after the first 30 minutes, it will cost you per 30 minutes. To avoid paying the extra fees, find a bike stand every half hour and exchange your bike, which resets the clock. Use these pit stops as an opportunity to explore the areas above. Photo by Lauren (Global Locavore)Toronto is an extremely multicultural city and it’s possible to “travel” the world without leaving Toronto within its many distinctive cultural neighborhoods with fantastic food, shopping, and people watching. Local’s itinerary: Start your day in Chinatown for a brunch of Dim Sum at Rol San, a local budget favourite. Afterwards, walk to Kensington Market, a diverse, fun neighbourhood in the heart of the city, which shines on Pedestrian Sunday. Shop at its many clothing outlets, record shops and secondhand stores before grabbing a seat on an outdoor patio with a drink. Later, walk west along College Street to Little Italy where you can enjoy some gelato and excellent people watching. With world-class museums, art galleries, and studios, Toronto is a wonderful place to enjoy a dynamic arts scene. Annual festivals including TIFF (Toronto Film Festival), North by Northeast (live music festival), and Fringe (live theatre festival) offer the perfect opportunity to discover up and coming artists. Open year-round, the Royal Ontario Museum (ROM) and the Art Gallery of Ontario (AGO) offer cheap access to their general galleries. Local’s itinerary: Spend the afternoon exploring downtown on foot. 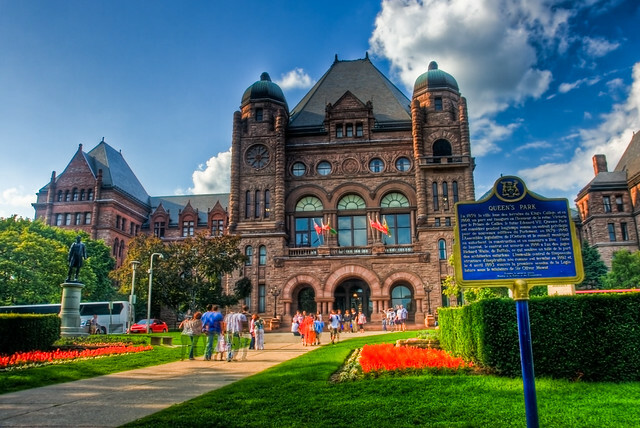 Make sure to visit Nathan Phillips Square, the Eaton’s Centre and Queen’s Park. Take a stroll through the University of Toronto Campus and grab an affordable early dinner at one of the plentiful food trucks. Enjoy an affordable evening of culture at the AGO or ROM. Insider’s advice: NOW Magazine is an amazing, free weekly newspaper that lists all the latest events including music shows, art installations, movies, theatre openings, and so much more. Pick it up from the newspaper boxes on just about every street. Budget tips: Save by planning ahead by visiting on the days with discount admission. The ROM offers $10 admission on Fridays from 4:30pm-8:30pm and the AGO has free entry on Wednesday nights from 6-9pm. Bonus: The COC offers a weekly free concert series on Tuesdays and Thursday from 12-1pm during several months of the year. Enjoy a break from the city with a walk through an urban forest. High Park is a large park located in the west side of Toronto, perfect for a day in nature. Local’s itinerary: High Park is easily accessed by its namesake subway station (High Park). Follow the paved trails that crisscross the park to discover a pond with many wildlife species and a public pool. There is also a zoo with deer and bison. Once you’ve had your fill, leave the park by the south side, close to the waterfront. Enjoy the views as you walk down the car-free waterfront path to the Humber Bay Arch Bridge. Finish your walk in the Roncesvalles neighbourhood, where you’ll find plenty of restaurants and cafes with patios. Insider’s guide: If visiting in the spring, come on a weekday to experience the cherry blossoms in relative peace. If visiting in the summer, Shakespeare in the Park puts on a nightly play which is pay-what-you can. Budget tips: Entry to the park and the Zoo is free. One adult day pass to the pool is $3.50 and the lockers are free if you bring your own lock. Having dinner at one of the neighbourhood Polish restaurants in Roncesvalles can be economical and very hearty. More information about where to eat in this historic neighborhood here! The Toronto Islands are a series of pretty, miniature islands in Lake Ontario. These tranquil, car-free islands are easily accessible by a short ferry ride from downtown Toronto making for a lovely, inexpensive day trip. Local’s itinerary: From the ferry docks, take the Ward Island ferry, which will drop you at the eastern part of the island. Go for a walk along the pedestrian-friendly streets and marvel at the cottage-like houses before grabbing a spot on the beach. Stroll along the boardwalk along the southern shore. Midway you will find the busy and aptly named Centre Island. There are a number of overpriced activities, including renting a bike, concession food, and amusement park rides. Instead, play a game of FREE BYO (bring your own) frisbee golf on the dedicated course. Afterwards, walk west to Hanlan’s Point, a clothing optional beach filled with friendly locals. It’s the perfect place to have a drink and watch the sunset over the city before taking the Hanlan’s Point ferry back downtown. Insider’s advice: Plan a full day visit by arriving early and staying until dark. Avoid the lines at the ferry by travelling at off-peak times and skip the line entirely by purchasing your ticket online in advance. The ferries leave from Jack Layton terminal and run regularly (every 15 minutes) in summer. Click for the daily schedule! Within the Don River Valley, you will find a stunning example of urban renewal within an abandoned brick factory. The Evergreen Brick Works (EBW) is a sustainable tourism highlight and fun for all ages! Local’s itinerary: Visit EBW on a Saturday or Sunday. Enjoy a late breakfast of local, organic produce at the Farmer’s Market before listening to some great live music. There is a free walking tour at 2pm lead by knowledgeable guides (more information about the tour). Drop by the children’s garden to learn about growing food and building with natural materials. Lastly, visit the garden market for environmentally friendly souvenirs. Insider’s advice: Evergreen has a calendar filled with free events that are worth looking up when planning your visit. Take a self-guided hike in the park behind EBW to enjoy ponds filled with turtles, beavers and fish. Be sure to climb to the lookout for a great view of the river valley and Toronto. Budget tips: The EBW is completely free, however prices at both the market and the cafe can be high. To get there, take the free shuttle bus that leaves from Broadview Subway Station every half hour. If you drive, parking is expensive and limited. Getting to Toronto will likely involve a stop at Union Station which connects directly to the TTC. If you are arriving via Pearson Airport, you can take the new UP Express train to Union. Those taking flights from Billy Bishop Airport can take a shuttle from the island to Union. Both the VIA train and the regional GO bus are found at Union Station. A TTC bus (192) is available from Pearson Airport to Kipling Subway Station at the standard TTC fare. However, the extra comfort, convenience, and speed is well worth the extra fare on the Up Express Train. The problem with being a local is that you live in a city, which makes it difficult to have experience staying in hostels and hostels, however Karen has stayed in a number of hotels around the city, from Yorkville to Downtown. According to Booking.com, you’ll pay about 60-70 per night for a low/mid range hotel although you can book a hostel bed for $29-$39 per night. Check hotel and hostel prices in Toronto now! Have you been to Toronto? Which of the six itineraries appeals most to you? Enjoyed this? This was written by guest author, Lauren! Lauren is on a mission to change the world through the power of food. Global Locavore is a sustainable food tourism website dedicated to connecting travelers to local food experiences. Lauren chronicles her journey around the globe through stories about growing, sharing and eating really good food. Follow along on through her Blog, Facebook and Instagram. Love to go back for longer and explore some more of Toronto and Canada. I found this to be such a helpful and comprehensive guide to Toronto and the pictures helped to build a really nice image in my mind. Honestly had no idea Toronto looked like that! I especially like the little tips here and there including bringing your own lock to the lockers, such a great idea 🙂 thanks for the piece! I’ve never been to Toronto but it does look amazing.And how great that you’ve offered tips on saving money – a girl after my own heart! What a nice post to kick of the guestblogging! I never imagined Toronto to be this colourful and cool.. or hip is the world? I’d definately include a day or 3 if I’d ever plan my Canadian roadtrip. I love watching pictures of places I’ve never been before. Toronto seems to be really great! Wow, Lauren did an amazing job guest writing for you! It adds a lot of great content to your site! She had some really good insider tips, like how to skip lines and save money on renting the bike. I would totally use this if I ever find myself in Toronto! Great guide!! Nothing better than getting some local tips, right? I would love to rent a bike in Toronto and explore the city, these multicultural neighborhoods sounds really nice as well. I hope I can go to Toronto very soon and get to see all these things. Loads of insider information and extra details in this guide to Toronto. I have been there lots of times but I still got some new ideas from this post! Love the photos too! This is a great guide! I love Toronto and spent quite a few weeks there in the past eight years, but it’s such an amazing city, there’s always new things to explore. I was in Toronto last year, and although I am a BC girl in my hearts of heart I still liked Toronto, especially the food! Loving these super budget tips, Canada is expensive! Hi! I liked the post! I found it a really helpful guide and the pictures look amazing. I had the opportunity to live in Toronto some years ago and I have only good memories. The city, its citizens, the food… everything is special there. Highly recommended!! Wow this took me back – I lived in Toronto 26 years ago! Although I have been to Canada since I haven’t returned to Toronto- I think it’s time I did! Queenstreet is so cute! And all that cultural food…I will be in heaven! I love all the locals tips. These are the best kind of guides. Thank you! I visited Toronto in early September and was blown away by how hot it was – I wish I would have known about some of these places then 🙂 One activity I’d add though is renting a stand-up paddle board at Woodbine Beach – especially on a hot and sunny day! Thank you so much for these tips and suggestions. Makes my decision process sssooo much easier with such insights!